Home > Crochet > Free Crochet Patterns > Granny Square Afghan Crochet Edging Pattern … Finishing my Scrapghan! I am finishing up my granny square scrapghan and am loving how it came out! I decided on a very simple crochet edging and of course want to share the pattern with you in case you want to try it too. 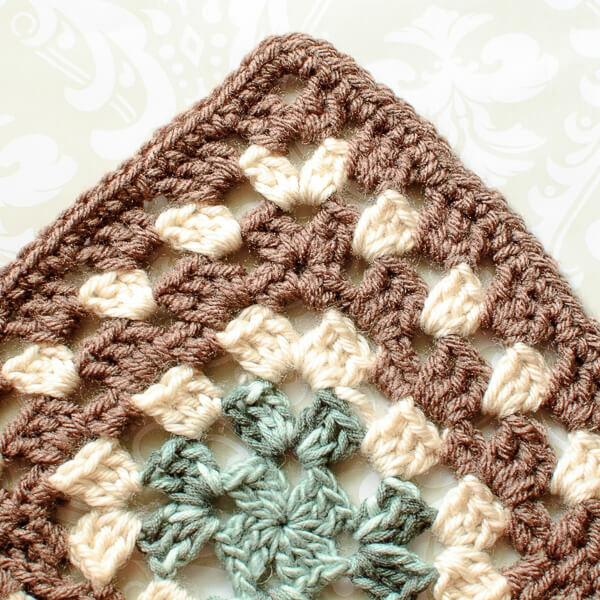 If you haven’t tried making your own scrapghan yet, check out my free granny square pattern here to get you started. 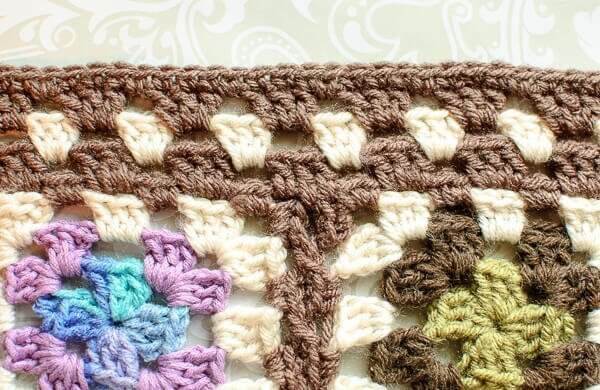 The best part about this granny crochet edging is how simple it is and how perfectly it fits with your granny design! After joining your squares (you can find my tutorial on joining here), join your first edging color in the first chain space from Round 4 of one of your squares. Row 1: Ch 3 (counts as dc), work 2 dc in same ch-sp, ch 1, 3 dc in next ch-sp, ch 1, 3 dc in next ch-sp, ch 1, when you reach the corners of where the squares join, *work 1 dc in first squares corner, 1 dc in space where squares were joined, 1 dc in corner of next square, continue working 3 dc, ch 1 across next square, rep from * across side to end, work [2 dc, ch 3, 2 dc] in corner space, repeat around for each side and corner, join and fasten off CA. Row 2: Join CB in any ch-1 sp along side, ch 3 (counts as dc), work 2 dc in same ch-sp, ch 1, *3 dc in next ch-sp, ch 1, rep from * to corner, work [2 dc, ch 3, 2 dc] in corner space, repeat around for each side and corner, join and fasten off CB. Row 3: Join CA in any ch-1 sp along side, ch 3 (counts as dc), work 2 dc in same ch-sp, ch 1, *3 dc in next ch-sp, ch 1, rep from * to corner, work [2 dc, ch 3, 2 dc] in corner space, repeat around for each side and corner, join but do not fasten off. Round 4: Ch 1 (does not count as stitch), *work 1 sc in each st and ch-1 sp to corner, work 4 sc in corner ch-3 sp, rep from * around, fasten off and weave in ends. Do you have a border pattern for a giant granny square preemie blanket? I am making one using ice cream yarn by Lion Brand. Thanks. Like the pattern you show here. In the photo it looks like you also did a row of single crochet for the last row. Good catch! You are correct … I did work a round of single crochet for the last round. I must have accidentally left that last round out. Thanks for letting me know! Love the edging you chose. Looks great. I really like the colors that you have put together here! I need to make a scrap ghan myself, I’ve got so much scarp yarn 🙂 Thanks for the links and the edging pattern! Love this! I just may use it for my #52weeksofgranny blanket that I’m making for charity.